The CleanCube Project is built on a holistic model designed to provide an accessible, affordable source of clean water to people who need it most. Currently in the prototype stage, the CleanCube product is a dissolvable cube made of natural plant-based material that can be added to stored drinking water to kill 100% of E. coli bacteria. This product is part of a larger system that includes small batch production, community-based education, alternative marketing and distribution strategies, and appropriate pricing that fit the realities of CleanCube’s target users. The goal of this systems approach is to create a fully sustainable model that can create local social and economic impact and reach scale over the long term. CleanCube's community events are a powerful medium for educating and promoting behaviours and activities that can make a community healthier. Using storytelling, music, and dance, these events are used in each community where the CleanCube Project expands its reach, it terms of education, production, and distribution. The CleanCube Children’s Activity Book is a learning tool that is distributed as part of the CleanCube Ambassador Kit. It is intended to encourage children to adopt simple yet effective hygiene practices that will help them stay healthy and happy. This book also aims to show children the importance of respecting and caring for water. The book includes stickers and pages that can be coloured. Making the connection between the sacredness of the water in the holy Ganges River and the water found in a drinking glass is one way to reach people and underscore the importance of clean water. 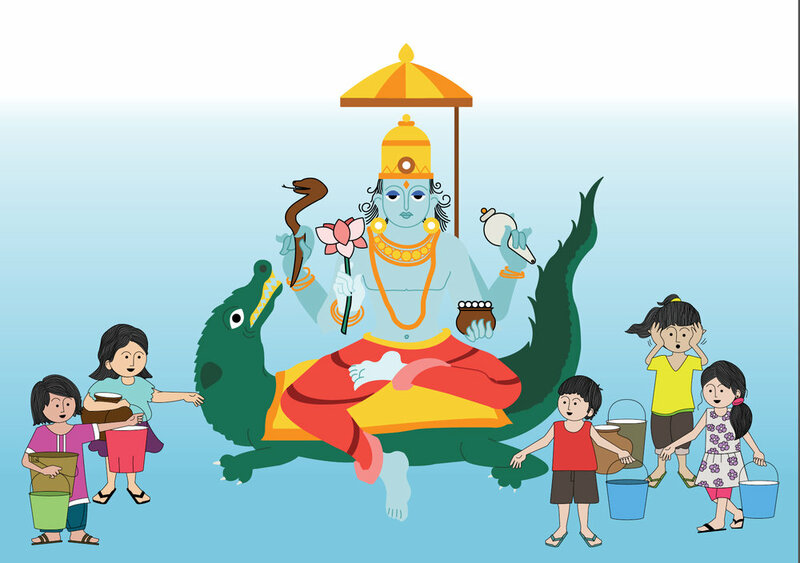 Varuna, the Hindu god of water and cosmic order, is at a heart of CleanCube’s community education initiative aimed to communicate the importance of balance in nature and of the need for respecting and cleaning water. Working in conjunction with a local doctor, free weekly health clinic focus on women and children help to build trust and rapport with women in the community. Making the connection between water, health, sanitation and hygiene is a critical cornerstone of the CleanCube Project and the community’s buy-in and participation in the project. CleanCube is made from natural plant materials shown to effectively eliminate E. coli from water. This solution can be produced and distributed easily and affordably. Added to stored drinking water at the household level, CleanCube can make one liter of water safe for drinking for Rs 1 or about $0.02 while a week’s supply of clean water for a family of five costs Rs 50 or $1. The CleanCube model offers women in the local community the opportunity to work nearby their homes for 2-3 hours per day, allowing them to fit these activities around their daily household responsibilities. Working collaboratively in small groups, women receive health training and are guided to meet production goals. They adhere to high quality standards and earn enough to supplement their household income by 30-50%. Women in a local community are trained as CleanCube Ambassadors and visit other women in their homes one-on-one or in small gatherings. Using the CleanCube Ambassador Kit, a laminated flipchart that serves as a visual guide, the Ambassors connect daily water usage to sacred traditions and underscore the importance of clean water. Ambassadors demonstrate safe water handling practices including how to use the CleanCube product to remove bacteria from water. Waste, water, and health are inextricably linked in the CleanCube pilot community. Most homes have no indoor bathrooms - toileting facilities are located in an open field. The community has no waste management system in place so dumping of household garbage is done in various areas close to homes. Here power outages are common and household taps deliver water but for only part of the day. There are several hours or sometimes days in a row in which no running water is available and so reliance on stored water is crucial. This situation is reflective of thousands of slum and rural communities across India. Field research in the community reinforced the need to look to low tech, intuitive methods of cleaning water. Plants, particularly those that are widely available and familiar to the average Indian household are the focus of the CleanCube Project’s research. Digging through recently published studies as well as ancient Vedic texts, identified a number of plants and their abilities to eliminate bacteria in water. Working with India-based traditional medicine practitioners and microbiologists, native plants, used traditionally in Hindi ritual and throughout Indian culture, have been the focus of the CleanCube project. CleanCube’s small batch production model trains women to work close to their homes for 2-3 hours per day, allowing them to fit these activities around their daily household responsibilities. Women are given an orientation and training to educate them about the importance of clean water, hygiene, and health as well as about the production process, the concept of quality control and the importance of working together as a group. After hands on training and guidance for the first few days, the groups are in full production mode with the women finding ways to improve and perfect each part of production. Through this model, women are able to meet their production goals and adhere to high quality standards. They earn enough to supplement their household income by 30-50%. Production pay provides a living wage while also allowing the projected retail price of the CleanCube product to remain highly affordable at 1 Indian Rupee per 1 Litre of clean water. Based on this, a week’s supply of clean water for an average household costs Rs. 50 or the equivalent of less than $1. Making the connection between the sacredness of the water in the holy Ganges River and the water found in a drinking glass is one way to reach people and underscore the importance of clean water. The CleanCube team’s research rediscovered Varuna, the Hindu god of water and cosmic order, who over the centuries has been somewhat forgotten as newer gods became more revered. Reviving Varuna, bringing him back into the conscientiousness of the average Indian, is an opportunity to communicate the importance of balance in nature and of the need for respecting and cleaning water. CleanCube’s community education initiative is built around an original story created to make this connection clear. At the centre of the story is Varuna and five young girls as they gather water for their homes from the community tap. Along the way the girls meet Varuna and learn important lessons about water. From the water cycle and the water in the human body to the sacredness of water across religions, Varuna teaches the girls to respect water and to stay healthy by drinking clean water. An empty lot in front of the local primary school within the pilot community was transformed into a temporary outdoor event space. A stage, lights, and sound were set up and the illustrated story was projected onto a backdrop. It was narrated and incorporated live acts. A local magician and Indian classical dance troupe presented water-related performances that were integrated into the broader story. With over 300 hundred people in attendance at this free community event, it proved to be a powerful medium for raising awareness of the importance of clean water to the health of the community. Implemented on a modest budget, this event is designed to be easily replicated in each community where the CleanCube Project expands its reach. Compared to a traditional education and media campaign, which would be far more expensive and less likely to reach people of one specific targeted community, this type of localized community event is a highly effective approach. Understanding how to reach users with a water-cleaning product is another key aspect of the CleanCube Project. Instead of relying on a traditional distribution model focusing on store shelves, a door-to-door ambassador approach promotes CleanCube in a way that fits with the daily realities of women. 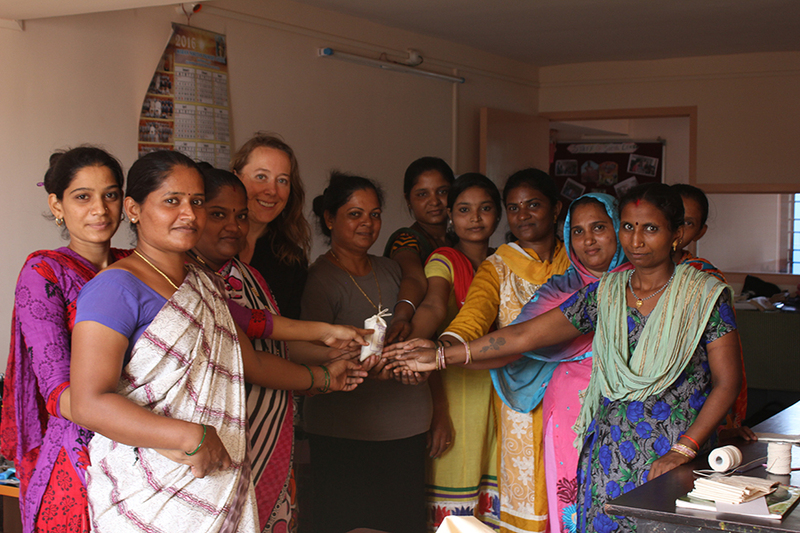 Women from the local community are trained as CleanCube Ambassadors. They visit other women in their homes one-on-one or in small gatherings, and using the CleanCube Ambassador kit, they teach them about the product. The Kit connects daily water usage to sacred traditions; it underscores the importance of clean water and demonstrates safe water handling practices, including how to use the CleanCube product to remove bacteria from water. The Kit includes a laminated flipchart that serves as a visual guide to the Ambassadors’ discussion with women regardless of the literacy level or language spoken. The Kit also contains a children’s book, which includes stickers and colouring pages. This book, given to children in the home, reinforces the ideas about the sacredness of water and the connection with daily water habits.